Hockey Plumber: NHLPA Power Shift... really shifty! I have no "insider info", no contacts close to the Union, etc... but the circumstances of the firing of NHLPA Director Paul Kelly should raise a red flag from any distance or point of view. 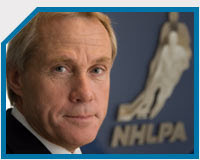 Kelly was considered, by many, to be the first legitimately untarnished NHLPA leader. 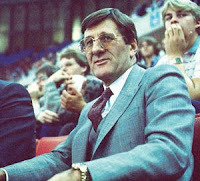 Kelly was instrumental in exposing the corruption of the Association's first Director, Alan Eagleson and sent him to prison on theft and fraud charges. Kelly seemed intent on investigating and rectifying past Union corruption. You might think that such ideals would be welcomed. Yet, remnants of that corrupt past, seemingly still lingered inside and a faction against Kelly formed. A group consisting of the Union’s legal counsel, Ian Penny, ombudsman, Buzz Hargrove and chairman of the Union’s advisory board, Ron Pink built a case against the director. According to sources, part of this group’s desire to get rid of Kelly also stemmed from Kelly ordering an internal audit (by a top former FBI forensic accountant) of the players' association's expenses during the previous three years before he took over. That audit was still ongoing prior to Kelly’s dismissal. Sources claim that through the audit, Kelly discovered that then-interim leaders Penny and Lindros were [allegedly] spending millions of dollars of the union’s money. Lindros ended up resigning, but word is, that move fueled this attack on Kelly, and Lindros was very much involved. If the allegations are indeed true, the somewhat bizarre timing of the move makes much more sense. When planning a coup, depose your target before he is able to fully expose your wrongdoing. From the outside looking in, it would appear that the battle plan formed something like this: Kelly was about to take down the remaining faction of the old regime. Ideally, they would need to strike first with the Union. Attempt to raise suspicion, and then try to persuade the collective by alleging similarities attributed to former directors. The only divulged reasons for the move include that Kelly supposedly read the transcript of a confidential "players only" meeting...His predecessor, Ted Saskin, was fired for secretly monitoring players’ emails. Additionally, Kelly was accused of having too close a relationship with NHL commissioner Gary Bettman and deputy commissioner Bill Daly... reminiscent of Alan Eagleson. By striking first and spreading fear and doubt inside the minds of the players, Penny, Pink, Hargrove and Lindros were successful. However, the Association just might have been duped by the very sort Kelly hoped to protect them from! red flag indeed. well said. all of it.